Eight students from The Claremont Colleges (three from CMC) and eight faculty members from The Claremont Colleges (including Albert Park, Associate Professor of History at CMC and Co-Principal Investigator EnviroLab Asia) went on the trip. 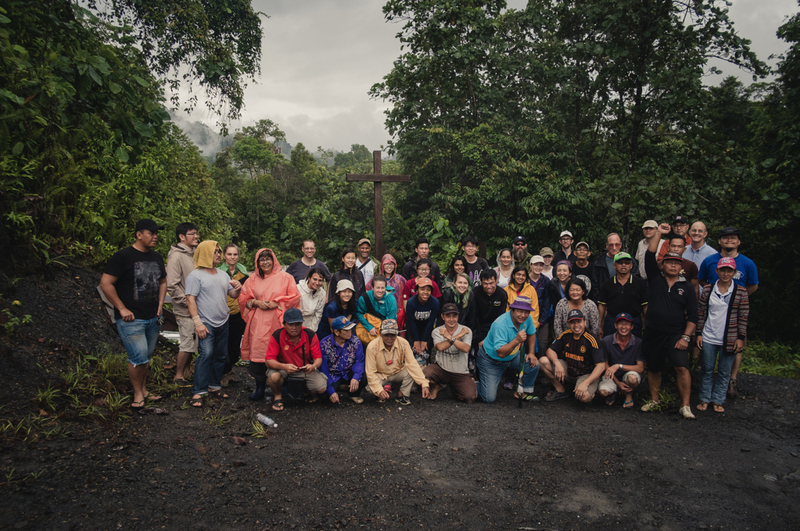 All of the students and faculty members were EnviroLab Asia Fellows. EnviroLab Asia is a five college initiative with CMC as the lead college. In addition, 14 people from Yale-NUS College (Claremont’s official partner in EnviroLab Asia) joined the Claremont contingent in activities in Singapore and the trip to Borneo. Yale-NUS acted as host letting students and faculty from Claremont stay in their dorms. The Claremont Colleges-Yale-NUS team conducted fieldwork and interviews that sought to shed light on the relationship between deforestation on social, economic, cultural and political processes. In particular, work will be done to see what scientific processes behind deforestation influence haze issues and the overall quality of life (both human and animals) in Southeast Asian countries. “We envisioned the clinic trip as way to enhance the research done already by gaining knowledge and perspectives through directly talking to people and encountering experiences in the areas we are studying,” says Prof. Park. The trip, according to Prof. Park, was for on-the-ground research for projects being carried out by the EnviroLab Asia Research Clusters. In Borneo, the students traveled to areas outside of Miri, Sarawak (Borneo) to investigate how deforestation policies have impacted the natural landscape and indigenous communities. In Malaysia Borneo (Sarawak), the students worked with a local NGO, Baram Kini, to visit sites related to deforestation, oil palm and other serious environmental issues like the construction of a dam that would wipe out hundreds of villages in the Baram area. The students also visited villages to learn more about indigenous cultures, their connection to the land and why they opposed the construction of the Baram dam. In Singapore, students had a chance to visit organic farms in order to learn more about food security and land tenure issues and to attend various workshops with BirdLife International and the Wildlife Conservation Society to learn more about conservation efforts to save forests in Southeast Asia. “We also had a productive meeting with Wilmar International, which is the largest producer of oil palm. We heard about their sustainability efforts. We held meetings with Wilmar and other organizations to gain a holistic, not one-sided, view of the issues we are studying.” Prof. Park says. But perhaps more than from any other source, the greatest insight about the problems facing Southeast Asia came from the villagers who live there. One of the biggest issues faced by the Dayak people in the Baram area is the issue of land rights and land tenure. According to Prof. Park, the Dayak people believe in NCR (Native Customary Rights), which are traditional rights over land. The clash of tradition vs. the progressive modernism over land rights seems to be at the heart of environmental issues in the region. “In some ways, we connected the land issue to things happening in Singapore,” Prof. Park says. “For example, organic farms in Singapore have limited leases on their lands because the government always seeks to reclaim land for development and military purposes. We also learned from the people about how much they rely on the Baram River to sustain their daily lives. For students who made the trip, it was special experience because it gave them a new, personal, take on the subjects that many had been pursuing at college. Johann Lim ’18 adds that the ongoing conversations students had, coupled with the immersive and intimate nature of the trip, opened his eyes to many complexities and aspects of environmental issues, such as the impact of deforestation on the way of life of indigenous people. “The EnviroLab Asia trip has been an experience which like no other and one which I will cherish a great deal for all the lessons I received and friendships I made,” he says. Finally, according to Prof. Park, students learned how faculty conducts research; the research clusters which serve as the medium through which faculty and students work together to do research. Click here to view photos from the EnviroLab clinic trip to Singapore and Borneo.